This class will teach you how to use fiber reactive dyes to color cotton using low water immersion (LWI) methods. Dyeing fabric using LWI gives you an uneven flow of color that provides incredible visual texture. It is a self-paced online course with access that never expires, so you can return to the materials whenever you like! We begin by covering what you’ll need to complete everything in this course. The few specialized supplies needed are easily available to order online and the bulk of what you will use are easily purchased locally, or better yet, scavenged from your recycling bin (and perhaps those of your friends as well!). We will also cover how to find a place to do your dyeing safely. Next, we’ll mix our primary dyes, two at a time. 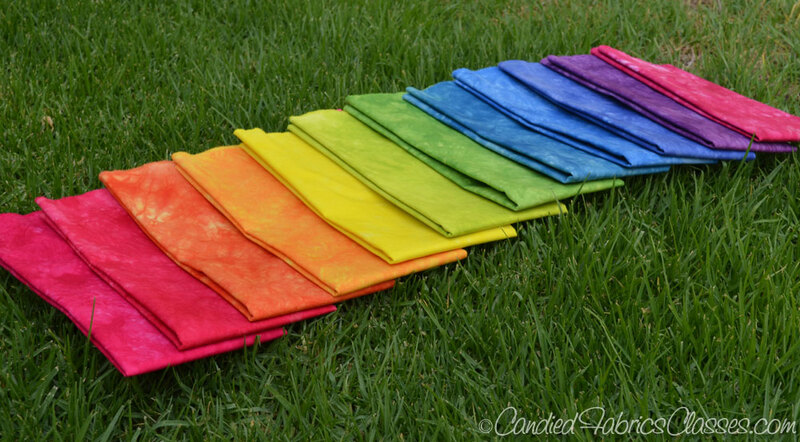 You’ll see just how much effect each particular dye has, and create a lovely range of colors. Dyeing a Color Wheel allows you to expand your knowledge of color theory, and stretch your understanding of color influence. Adding black to shade a color can have either a subtle or huge effect on its hue. We’ll add a range of amounts of black to our 3 primary colors and create some luscious fabric. Finally, we’ll mix complementary colors and end up with all sorts of what I call “complex” colors; very subtle changes to a hue that take it from a simple bright color to a more sophisticated hue, bringing to mind colors like “bing cherry” or “russet”, the kind of colors you find in the really BIG box of crayons! This is a self-paced course, meaning you can take it as quickly or slowly as you need to. I estimate that a motivated student could complete each session in about 6-8 active hours. If you wanted to, you could devote an entire weeks to following this through, beginning to end (what a creative vacation that could be!) However, most of us have lots of other things to do, so at every step along the way I will point out time sensitive steps and discuss how the work could be distributed to fit your needs. There is none! You will always be able to return to re-view a video, see if there are questions that other students have asked that are interesting, re-download a sheet that you’ve lost on your computer. The content of the site includes almost 3 hours of videos, 38 pages of .PDF files (all the content except for the videos that you can download and save on your computer) plus each session has printable formula sheets allowing you to dye the session using 4 different sizes of fabric (from fat eighths to full yards) using either metric or imperial measurements, your choice! Each session will have a Question and Answer forum associated with it – I will respond to any question you have within 24 hours, and both these questions and answers will be available for other registered students to view. The beauty of an online course is that if several people are having the some difficulty with a particular step, I will just create additional content to add to the session to clarify any confusion. 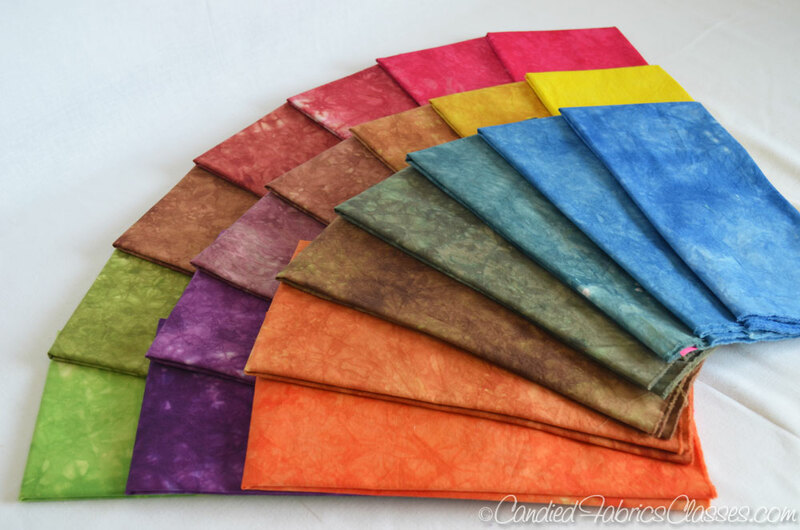 You love hand dyed fabrics and would like to make them yourself. By day, I teach biology to students at the University of Redlands who are non-science majors. I am very comfortable engaging my students and putting complex ideas into terms they understand. I’ve spent 15 years learning how to dye fabric, and developed this way of dyeing to accommodate my busy schedule and not waste my limited resources. I have 25 “how to” articles published in various Interweave publications (see list here), I have been a guest on four episodes of Quilting Arts TV, and I created a workshop DVD for Quilting Arts last August. A video clip from that can be found here, and is a great introduction to my teaching style. Not quite sure if you’d like one of my online classes? I’ve created a sample session so you can give it a try – Click here! My name is Candy Glendening, and I’m addicted to color. I’ve been dyeing fabrics to use in my art for over 15 years. You may have seen me on Quilting Arts TV or in an Interweave publication, I write up patterns for them often. I share my love of color by teaching online classes that teach people how to dye using Procion MX fiber reactive dyes. I have quite a bit of experience in shibori and printing with thickened dyes, but am tired of my sloppy outcomes in color. I like the tone of your presentations. Everything seems very achievable. I greatly appreciate your sense of order. This is the most well thought out online class that I have taken!!! Completed and hoping to start 102 anyday! It was a wonderful class Candy. Thank you for helping to clarify things for me. I can immediately see you are a gifted teacher- your planning, background preparation are evident in well presented materials. I think everything has been off to a great start so far. You definitely answer questions in a timely manner. I am very pleased with this course. I have been working on an 18 step gradation of tints using the calculations that I made with the New Candiotic Table Calculator. And my results are phenomenal. I am so happy! So far this class has worked really well for me. OK, I haven’t actually done any of the dyeing yet, but the instructions are clear, the videos are very helpful and I love the separate checklists and formulas. Also, I like being able to click on separate topics and go right to them, rather than having to look through the whole lesson to clarify something. I was so amazed with getting so many colors from 3 basic primaries. I feel like Candy has revealed the Secrets to Life, the Universe, and Everything to me! This class was so worth it! Thank you, Candy!